Another windy day here ... rain is coming. Expecting a big storm tomorrow, with high winds and pouring rain. Good day to stay home. Having an advanced brayering workshop, so my friends have to brave the weather to get here ... I appreciate it!! Today I'm getting ready for the workshop, practicing the cards we'll be making and getting the backgrounds of the cards all cut and ready to assemble. The main focus of the workshop is brayering, so I'll basically assemble "card candy" to finish the cards once the backgrounds are brayered and stamped ... will post more on this tomorrow along with pictures of the cards we make. For today, I thought I'd get a head start on some Easter baskets. I found this template last year, but too late to use it for Easter and completely forgot about it! Of course, this can be used for any time of year ... it makes a beautiful container for any small gift. I decided to make this into a "Thank You" basket ... who wouldn't love to get this as a gift!! Fill it with small potted flowers, candy, lotions, or whatever. It's really sturdy when you use SU! 's high quality, thick cardstock. Here's a picture and the details of the basket. For more details on how it was made and a video tutorial, check out StampTV. Hope you like. 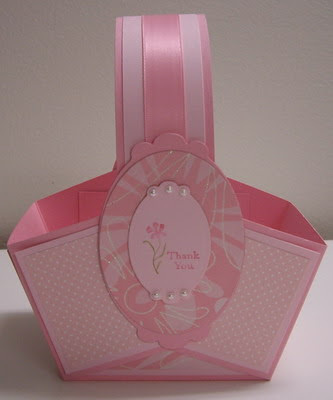 "Pretty in Pink Gift Basket"
See video link above for details on how to assemble the basket. The only change I made in the construction was when adding the brad. In the video, you are shown to pierce a hole through the back panel of the front and back of the basket in order to attach the handle. I lowered the hole about 1/4" so the it also went through the two panels that cross over in front of the back panel - making it more sturdier. For the embellishment on the front and back, I used my Nestabilities Label Ten die-cut along with the matching oval die-cut and layered the panels. I used the small Label Ten for the sentiment (front only), which was stamped with Regal Rose and Old Olive inks. The small white half-pearls were added at the top and bottom for extra detail.